I am taking a break from blue/green crepe tunic to work on the pink crepe tunic. zardosi tubes are worked into the petals. These beads are bought from India. Better choice of colour of zardosi tube was not available. So started with the same colour tube. I picked up the idea of cutting the tubes with nail cutter, from a Thai embroiderer at Muscat festival. The detail of the front panel. This is the first time attention is given to the varying length of the tubes. Earlier they were all cut together and worked into the project without much care. Another step in the right direction. Just to get a breather in between, the kutchwork/ mirror work pattern was traced on to maroon cotton fabric for the brown linen tunic. 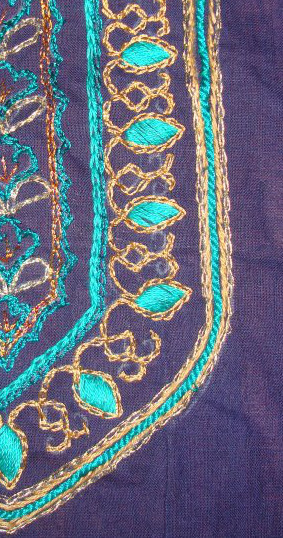 I started with the kutchwork inside the mirror pattern in brown thread. After completing the Randje per week 2015 edges this week, kutchwork samples inspired by these edges were also worked during this week. The details are here and here. This week’s edges on Randje per week challenge2015 were completed. 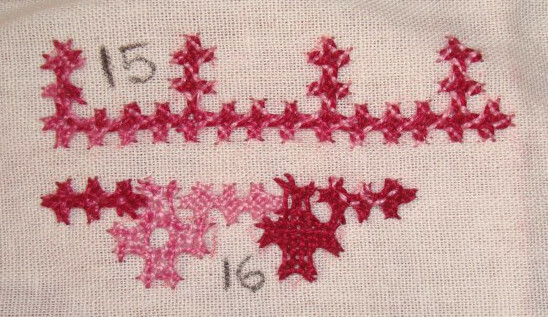 Based on these cross stitch patterns two kutchwork samples were also worked during this week. I started chain stitch with golden brown cotton skein on blue/green crepe. This is in progress. 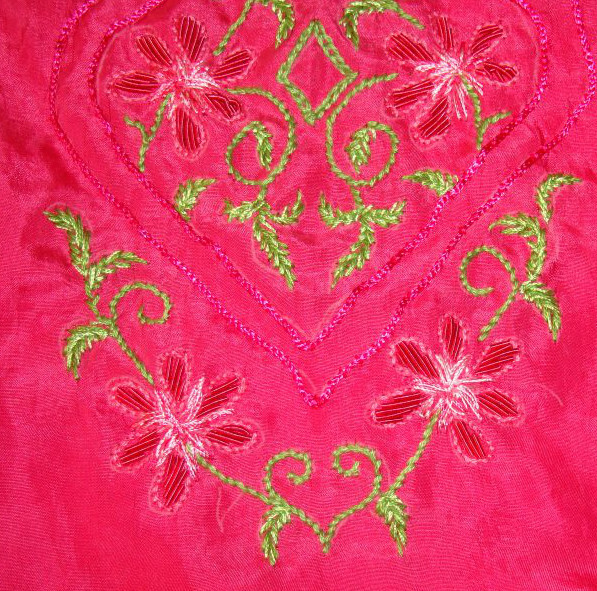 The pink crepe tunic needs to be worked on, and takes much more time than I anticipated. The flowers were outlined with stem stitches in cotton skein. Now the parallel lines need to be couched. After drawing some kutchwork samples for the past few weeks, an idea of triangular kutchwork pattern came to mind, which was then made into a square. I have been thinking of alternating this with a mirror pattern to form a border. 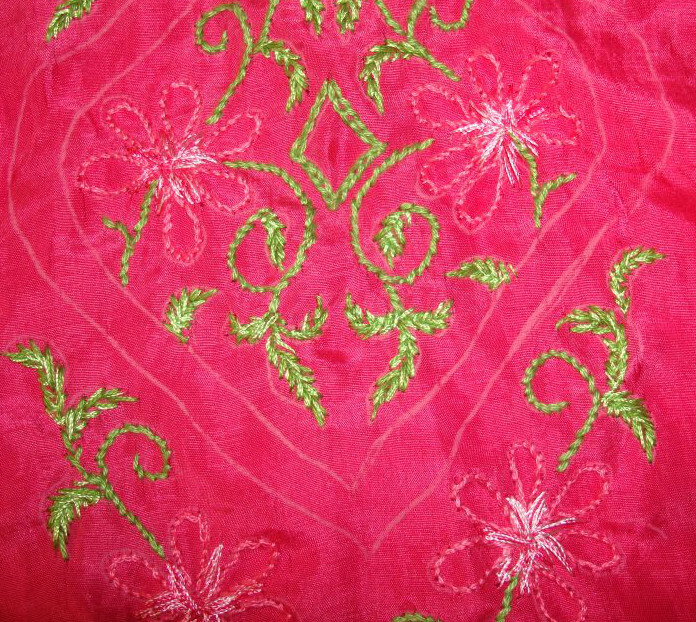 There is idea of using it for a brown linen tunic.